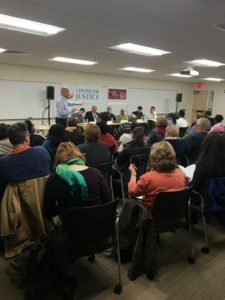 On October 25, 2016 the Center for Justice hosted The People’s Fight for Water, Power, and Light, a panel event and discussion on the crisis of public utility service termination in low-income communities across the United States and the work done by legal services providers and organizers to combat this challenge. Held in a packed room at Roger Williams University’s Providence campus and streamed live on YouTube, the ninety minute discussion was lively and spirited, with questions and comments from the audience driving the conversation. Tony Romano, an Atlanta-based organizer from Right to the City moderated a panel made up of Maureen Taylor of Michigan Welfare Rights Organization, Marilyn Mullane from Michigan Legal Services, Spencer Resnick of Nobody Leaves Mid-Hudson, Richard Berkleyfrom New York’s Utility Project, Camilo Viveiros of the George Wiley Center, and Center for Justice Executive Director Rob McCreanor. 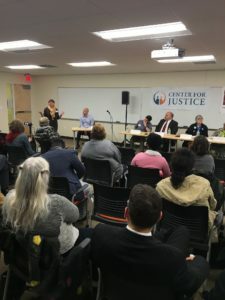 The panelists discussed the harmful impacts of utility termination and the numerous negative outcomes it directly leads to for individuals and families, as well as the campaigns waged by affected individuals, activists, legal advocates, and their allies to secure just and equitable access to basic utility services. They outlined major victories achieved through large-scale community mobilizations, litigation brought in court and in administrative tribunals against public utilities that violate the legal rights of consumers, and advocacy before regulatory and legislative bodies to reform energy policy in different states throughout the nation. While each of these campaigns was focused on a local issue–loss of water in Detroit, rampant termination and skyrocketing prices in the Hudson Valley, and systemic flaws and disregard of consumers’ rights and protection in utility termination procedures in Rhode Island–the crisis of utility shut-offs in America’s low-income communities is widespread and rooted in broader failures to address poverty and racial injustice. Conversations like this one, that bring together advocates and activists from across different states to discuss successful strategies and to challenge and empower one another to continue the fight in new and innovative ways are essential to achieving just and equitable utility policy. We would like thank the Rhode Island Foundation, Roger Williams University School of Law, and the Pro Bono Collaborative for their generous support in making this event possible.